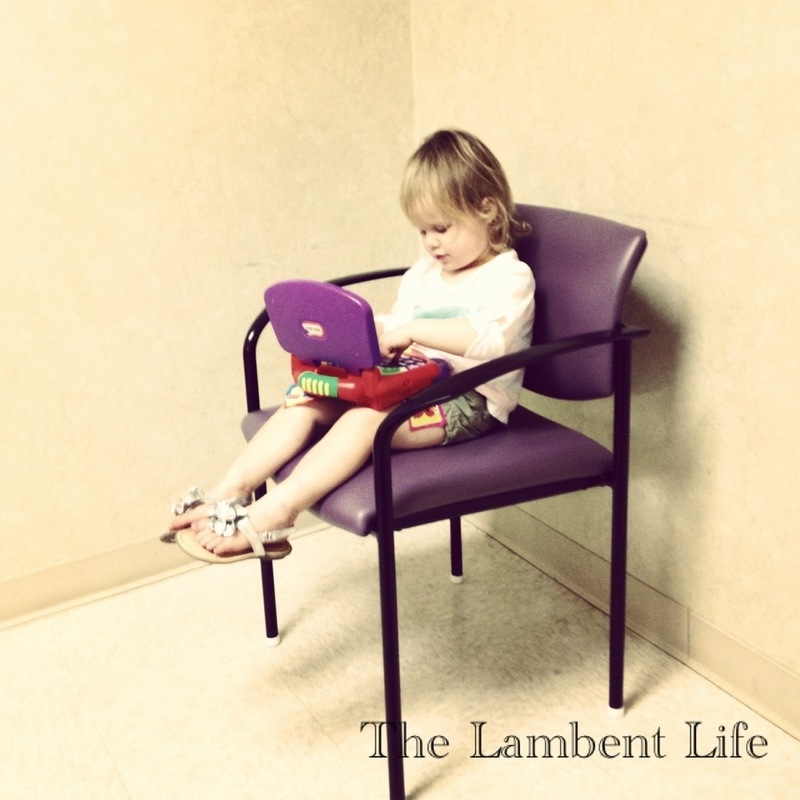 Yesterday, The Lambent Life celebrated its first birthday. Instead of toasting champagne, I tended to a growing cold with gallons of echinacea tea and Emergen-C paired and a bowl of vanilla ice cream with fresh strawberries for good measure. I topped off the festivities with an early 10 p.m. bedtime and so here I am, the day after, properly noting the milestone. Much like the first year of a child’s life, I’ve spent the past 12 months and 131 posts learning the ropes and figuring out who I am and what kind of blogger I want to be. And what kind I don’t want to be. 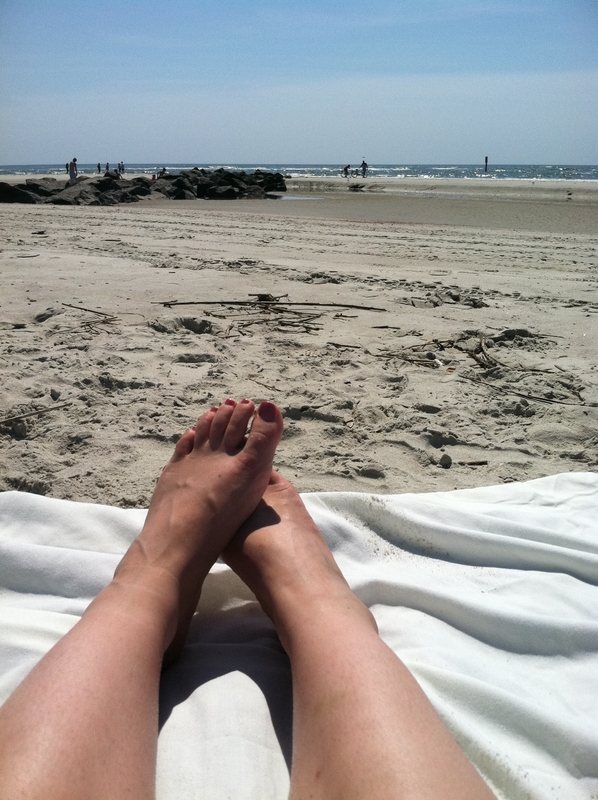 I’ve found camaraderie with other bloggers and learned from their experiences. And I’m happy with what I’m growing and how I’m growing. Like naming a child, it’s hard to pick the perfect blog name until you see its personality emerge. Josh, bless his heart, spent an entire afternoon last year brainstorming a good, reflective name. As usual, he came through. (of light or fire) Glowing, gleaming, or flickering with a soft radiance. (of wit, humor, etc.) Lightly brilliant. I don’t want to burn brightly and quickly. There is nothing wrong with seeing loads of traffic or gaining popularity but I never want blogging to be disingenuous or burdensome. You won’t find glitter or glam design at The Lambent Life (mostly because I’m technologically inept). I want The Lambent Life – and my life, in general – to be a gentle glow, a familiar word and quick smile. And I hope that comes across. Yesterday. The carwash is a scary place. Happy birthday, The Lambent Life. And thanks for sticking around. I really love Friday Favorites. There are about 15 things each week that I think, “oh! I should write a post about that.” but never do because a.) each post would be consist of about 5 sentences and b.) who wants to read an entire post dedicated to my love of yogurt? and c.) I lately have the attention span of a 3-year-old child (probably caused by raising a 3-year-old child). But a weekly thought dump? Completely acceptable and passable as a “real” blog post. There aren’t a ton of perks that come with Josh’s job. Except, like, a paycheck. For which I’m grateful, don’t get me wrong. But I found out yesterday that he’s being sent to a training in Bend, Oregon this summer and yours truly gets to tag along. And the best part? THE CHILDREN AREN’T COMING! Yes, five whole glorious days by myself. My incredible in-laws are coming to party with the girls while take a cross-country flight to the PNW to enjoy some R&R, shopping, spa treatments, and sight seeing. Well, Josh will be working so really I’ll just be enjoying those things. My myself. Squeeee! Admittedly, I’ve just started this book but it’s so good. 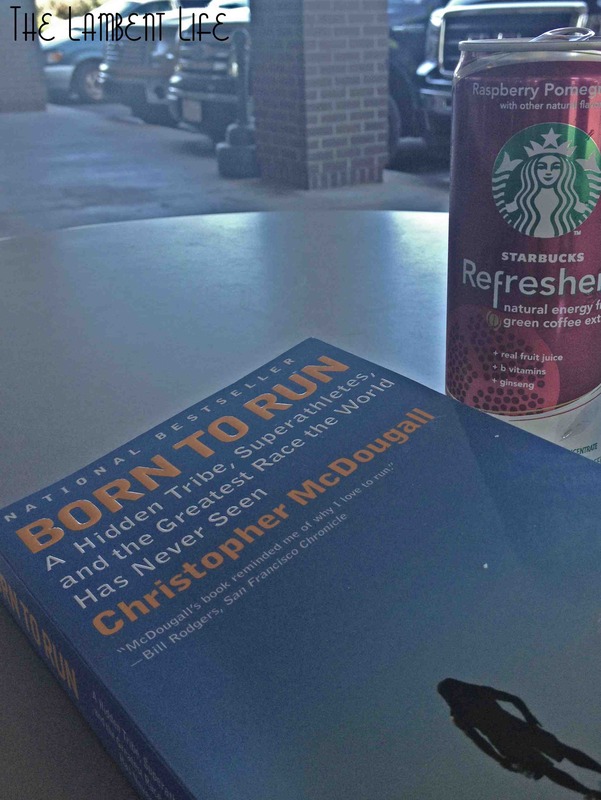 The author, Christopher McDougall is quite humorous and the story of the Tarahumara is legendary and fascinating. The Tarahumara live in the mountainous region of northwest Mexico and can run amazingly long distances without fatigue or injury. So McDougall, a reporter by trade, sets out on a journey to find the Tarahumara and learn the secrets to life and running. My friend Amie and I are toying with the idea of running the Savannah Rock ‘N Roll 1/2 marathon in November so I’ve been trying to be more consistent with my running and increase mileage without burning out. While I love to run, I’m not a fan of racing so I need to get my mind right before making a ($$) decision. But I’ll tell you, reading this book has put me back in the right mentality. Now if only I could figure out a way to run when it’s not 80 degrees. shades of pink. for real. Favorite fix: Snap, crackle, pop. I finally scheduled a very overdue appointment with a chiropractor and had my first visit this morning. 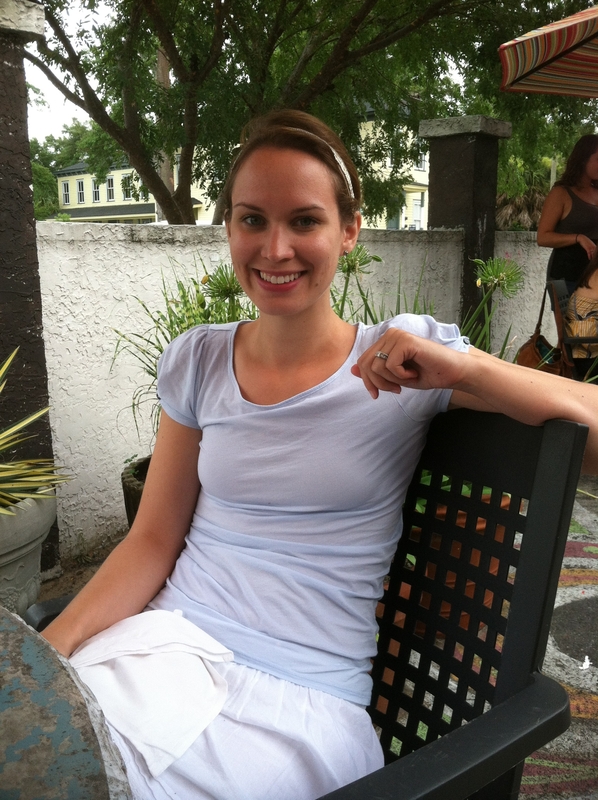 Before children, I used to visit the chiro for weekly adjustments but I haven’t been since I was pregnant with Emery. 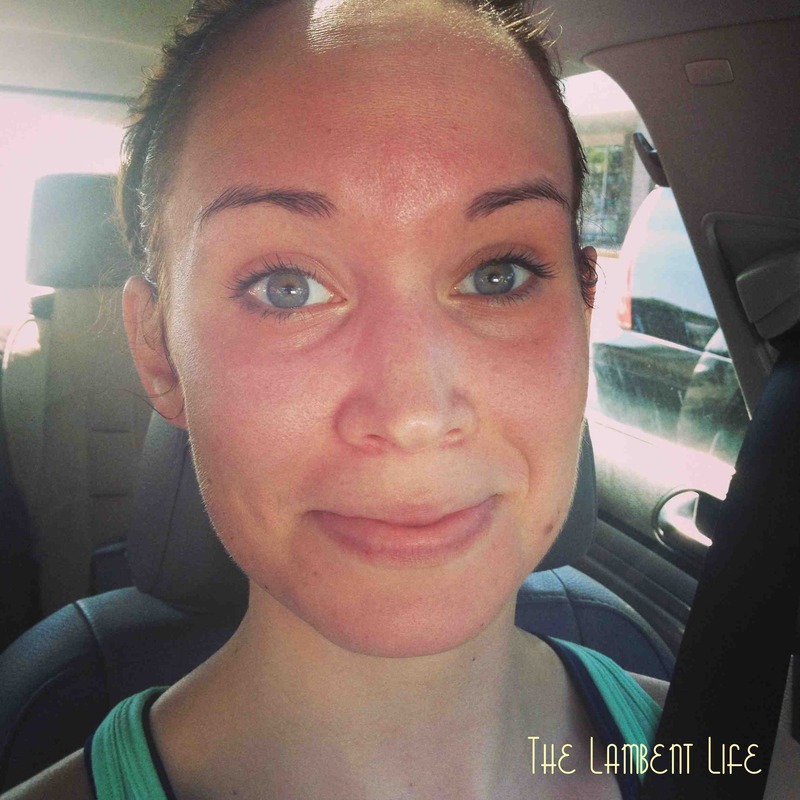 Between pregnancy, having a newborn, moving, and repeating steps 1 and 2, I stopped going. Big mistake. The physical and mental health benefits of regular adjustments is undeniable and heaven knows I need all the help I can get. Because I’m so tall, I tend to slouch which affects the curvature of my neck which, in turn, causes strain on my shoulders and stresses the muscles across the top of my back. I need to have better posture (as I slouch over my keyboard to type this…) and keep up with regular adjustments to alleviate the tension on my shoulders. I agitated my neck and shoulder a few weeks ago during a workout and it’s been tender ever since. I swear, as soon as I laid on the table and he adjusted between my shoulder blades – ahhhh. Sweet, sweet relief. I can even breathe easier. Then the doctor swore he didn’t believe that I am 6 feet tall and weigh 160 pounds. And then I hugged him and promised I’d never, ever stray and he’ll be my forever chiropractor until the day I die. Or leave Savannah, anyway. But really, that’s muscle for ya, folks. I’d rather have my strong, muscular legs that can carry me on runs than see a lower number on the scale. I don’t do this to lose weight. I do this to be physically and mentally strong. And that ends that tangent. We’re giving soccer another go and last night was Em’s first game of the season. Her team is the Yellow Dragons and despite this league being more organized than the last, it’s still a bit like herding cats. Her coach wasn’t there so the assistant coach filled in and he continuously called her Emma. She would stop and look at him when he shouted directions but she would then turn and ignore him as she thought he was talking to this imaginary Emma. Since, you know, that’s not her name. So, that was interesting. At least she ran out some of her energy that way? I think we’ll try ballet. My kindred spirit is leaving me for a great (small) land yonder north called New Hampshire. I’m so sad. We’re meeting at the beach tomorrow to say farewell and I don’t know how that little girl of mine will do saying goodbye to her favorite little man. Savannah has a lot of families that are just passing through. Sometimes it feels like we’re stuck in waiting while we watch friends who become dear to us journey on. Before moving to Georgia, we were always the ones who left and I’ve learned how much harder it is to be on the other side of leaving. And it’s hard to teach your kids. But it’s nice to know that with all the friends we’ve made on this journey, it’s likely we’ll cross paths again with at least some of them when it’s our turn to move on to new pastures. Fun weekend plans? Do you go to a chiropractor? 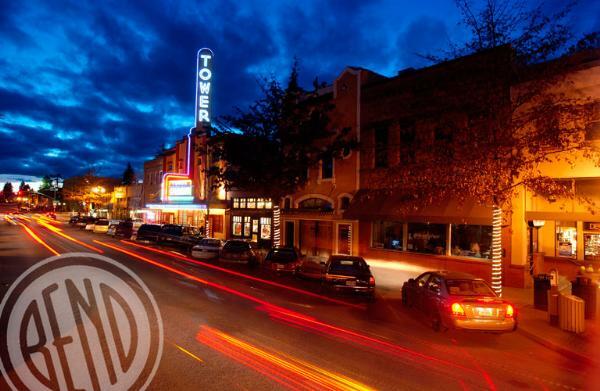 Anyone have tips on where to visit in Bend? Don’t look under the bed. The girls and I were homebound this morning because after 5 and a half years and over 80,000 miles, it was due time to get some new tread on the Vdub. Although I’m a stay-at-home-mom, I’m not really a stay-at-home-mom. I kind of really hate being stuck in the house. Barring illness, we get out of the house pretty much every day for a few minutes. The girls learned this behavior from me and, in turn, wake up every morning asking where we’re going that day and who we’re going to see. Since we had no choice but to chill at home, I decided to make the most of it and check a few of the more time consuming items off my cleaning list. There more than 200,000 things I would rather do before clean. Especially deep clean. You know, the pull-the-couch-away-from-the-wall, clean-on-top-of-the-cupboards kind of cleaning. But there has been this slight… odor… coming from Emery’s room. I’ve mopped her floor, checked the closet, washed the windows, changed her sheets, wiped the walls, washed the bedding, checked shoes and washed the rug. And yet, this slight smell remains. So with today’s extra “free time,” I turned on a movie and spent an hour beneath and behind her dresser and bed. Do not look under the bed. Do not clean under the bed. Under no circumstances. Ever. Apparently beneath Emery’s bed is where all the spiders in our house go to die. So many spiders. Of all sizes. Dead, thankfully. We’ve had a few run-ins with spiders since moving to Georgia. I remember most vividly the night I woke Josh around midnight after I saw a Georgia-sized spider saunter across our living room. Yes, it was big enough to saunter – it’s a Georgia spider, after all. So, my half-sleeping husband killed the big momma spider that was – unbeknownst to us – carrying baby spiders on her back. Those baby spiders survived the squishing and spread like the tide across our living room. We slept soundly that night and dreamt of baby spiders crawling in our bed to snuggle. We’ve lived in this house for over three years. In that time, I can’t say I’ve ever given Emery’s room a good, solid scrubbing. And now that I’m doing the math, I’m pretty embarrassed to say I think it’s been nearly 2 years since I peeked beneath the bed frame. And now that I know it’s a spider graveyard, I promise it will be at least another 2 years before I do. Because cleaning beneath beds, couches and dressers is now going on Josh’s ever-growing list of man chores. This momma doesn’t do spiders. And that faint smell? Still there. I think it may just be the smell of a dirt-loving, tutu-wearning, roly-poly-collecting, almost-4-year-old girl. 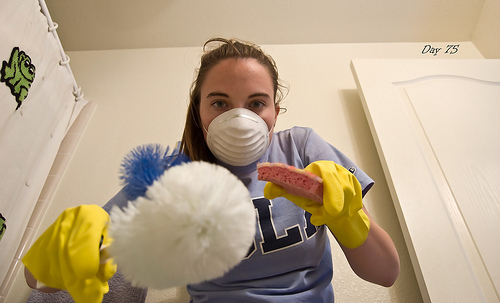 What household task do you pass along to your spouse? Confession time: I have this nasty little habit of trying to control everything around me. As I’m sure most mothers, wives, heck – females in general – do. Except I really don’t handle it well when I realize things are out of my control. I get a little crazy and go into overdrive trying to control the things I (think) I can control. Only that doesn’t work, either, and I’m left spinning out of control. I mentally don a pair of worn out, control top pantyhose and try hold it all in and together. Because as long as it looks nice to others, it doesn’t matter if I can’t take a deep breath or sit down comfortably. Because if I do, the seams are guaranteed to burst and all my mess is exposed for every one to see. I’m just as stubborn as my first born so it’s been shown to me time and time again just how little control I have over things. Usually involving my children. Oh, those sweet darlings. Blair’s milk challenge was horrible. It took three nurses and myself to hold her down and force milk in her mouth using a syringe. It’s pretty ironic since I spent the past 2 years keeping her away from the stuff. By the time we got to the last serving of 12 teaspoons, she was spitting it out as fast as they could get it in. When she started choking on it, I called it quits. We were there for a food challenge – not for water-boarding. So I spent the next 2 hours trying to convince a 2 year old to drink something she doesn’t like. I tried bribery, force, threatening, rewarding, demonstrating, discipline, begging, and encouraging. I called in reinforcements. There was nothing I could do. By noon, we were all done. There were 4 teaspoons left but it wasn’t going to happen. She had enough milk to know if she would react, thankfully. But I was spent. Completely emotionally spent. And then there’s the older one. I’ve spent months researching and lamenting over which school we’d like Emery to attend this fall. The public schools here are notoriously bad so securing her a spot in a “good” school for preK means she would be set for kindergarten and grade school. The application pool grows exponentially for kindergarten so we were really, really hoping she’d get a spot this year. We applied to four different schools. After the random drawings, she’s number 20, 39, 44 and 46 on each wait list. So, she’s not getting in. I can’t control everything. Heck, I can’t control anything. It’s a nasty thought cycle for me to get into. I start grasping at other things in my life to find some bit of order. I nag and pick at my husband. I demand my children listen to me. I obsess over food. I scrub the shower. I throw things. I spent the morning by myself. It’s becoming apparent to me that I need to spend time alone and doing nothing. These girls are wearing me thin so I refuse to feel guilty about paying someone else to entertain them. If I’m scrambling then I’m not being the best momma that I can be. I haven’t been running much lately and I need to. I drove to one of my favorite parks and just ran. I didn’t let myself check my pace or my distance. I didn’t want to race. It takes me a few miles to get to get my brain quiet. I know a lot of people run to work through issues. But I run to quiet the issues. I know they’ll be waiting when I’m done so I just need 45 minutes of not thinking. It’s really hard to lie to yourself when you’re sweating buckets and your heart is going to burst from your chest. I realized that I need to lose control. Life is messy. But I need to stop trying to hold on to everything so tightly that I start to self-destruct. In my efforts to protect myself and everyone I love, I end up hurting myself more. 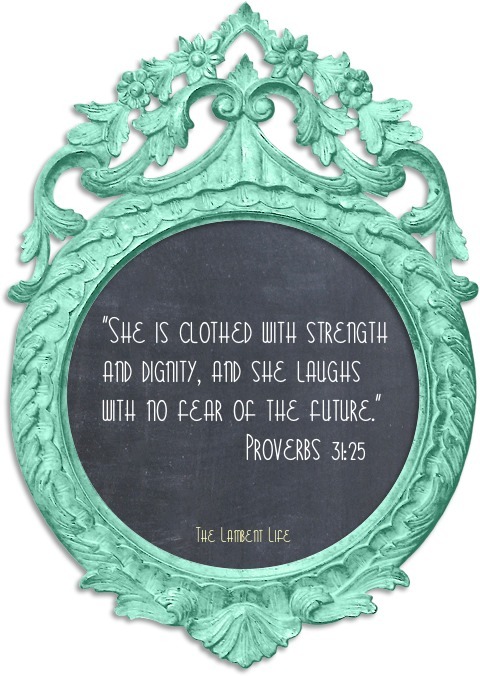 Yesterday, I came across Proverbs 31:25 not once, but twice. I’m not a big believer in “signs” but I do think that God knows I’m pretty thick skulled and need Him to be a bit persistent at times. Can you imagine laughing with no fear to the future? When I think of the future, I think of planning. And analyzing. And overanalyzing. And praying that God would make it so. Because apparently I think I can control God, too. So, I need to stop. And breathe. And trust. And keep running. And writing. And stop worrying. It’s Friday. We survived another week. And what a week it has been. I was at the gym treadmill this morning and was glued to the television broadcasting the most recent happenings in Boston. I couldn’t get over how close the television crews were to the police as they worked to secure neighborhoods in Watertown while searching for the second Boston Marathon bomber. It reminded me of the hours after 9/11 when we were all glued to our televisions craving answers and explanation. Eventually, I had to peel myself away to pick up the kiddos from child watch. Like I mentioned a few days ago, I’ve been feeling a little ‘off’ lately so it is my fullest intention to spend the weekend relaxing, checking items off the never ending to-do list and spend time with the family. This week’s Friday Favorites isn’t quite as well-rounded as the last but these were certainly peaks of joy in a rather melancholy week. After a bit of a hiatus, I made time for a much needed Pure Barre on Monday night. Afterwards I found myself next door at Fresh Market to pick up more Dreaming Cow yogurt. 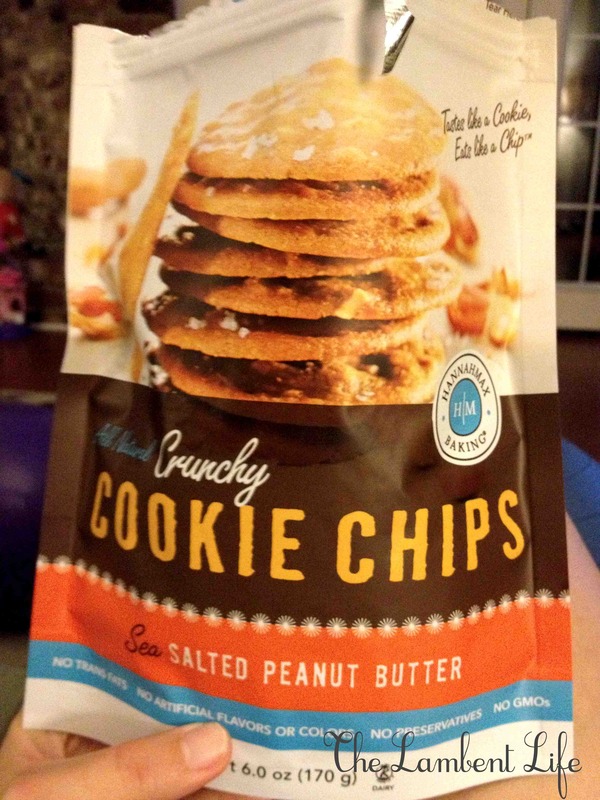 While there, I saw these Hannahmax Baking crunchy cookie chips on an end cap and knew I needed these bits of seas salted peanut butter goodness. Why have I never thought of sprinkling sea salt on peanut butter cookies?! Genius. Only 130 calories for 5 cookie chips. Win! I was holding on to this recipe from Kiwi Magazine for a few weeks until Blair was finally cleared of her milk allergy and it didn’t disappoint. I have a love/hate relationship with quinoa – mostly that I want to love it but typically don’t. 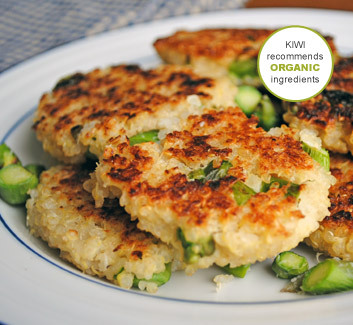 But when prepared in this fashion, the quinoa’s firm texture was beneficial. My mixture was a bit dry so I added an extra egg and even so, it was difficult to shape into cakes. I eventually threw it all in the skillet and cooked it like hash browns. Josh looked a little concerned when I served his plate but he was pleasantly surprised and finished off the leftovers. On Thursday, we celebrated a sweet little girl’s 4th birthday with a wonderful princess celebration. For the first time, Blair was able to be a completely “normal” (whatever that means) kid and enjoyed pizza, a delicious lemon and berry cupcake, and all the candy treats from the piñata. How was your week? Special weekend plans? I’ve been in a mental hibernation. Since the horrors in Boston, I’ve had a hard time wrapping my head and heart around what happened. I’m confused. And sickened. And heartbroken. Athleticism is honesty in its purest form. It’s physical and mental strength at it’s best. There is no faking it in running. It’s one of the only sports where the athlete has nothing to hide behind. There’s no fancy equipment, no riding on the coattails of others. Nothing to blame or credit for your performance. It doesn’t matter your gender, your race, your IQ, your body type, your popularity, your looks, your income level or if anyone in this whole wide world loves you for you. When you’re running, it’s just you and the road. So the attacks in Boston weren’t against Americans. Or solely runners. They were against basic human nature. We aren’t going to understand. We might dissect every detail and look into history but the truth is that we live in a fallen world where evil doesn’t follow rules or make sense. Yes, we should do all we can to try to ensure things like this won’t happen but the awful truth is that it will keep happening. But there is light in this world. There is faith. And there are good, selfless people. I’ve read that the Red Cross and Boston hospitals have been bombarded with donations and that is incredible. If you’re looking for a way to contribute, check out these shirts created by Moms Run This Town to raise funds for victims and their families. There are two design options and cuts for men and women. $8 of every shirt will be donated to the area of most need after some of the chaos settles. Today’s post is brought to you from the allergist’s office. Blair and I are wrapping up the first of her four hour food challenge and things are looking promising. Except that we have to hold her down and use a syringe to make her ingest the milk. And that she pooped her pants. And that I forgot to pack any water for her. Fortunately, it’ll be over soon. And I packed extra underwear and pants. And I left my gym water bottle in the car. She’s using the downtime to catch up on emails and the latest episode of Barney. She really isn’t tolerating us holding down her arms and legs and forcing the milk on her. It breaks my heart and makes me want to call off the whole thing. I mean, she doesn’t really have to drink milk. But we do need to know, I suppose. Anyway, this will be over relatively soon. Until then, back to Barney. I realize I’ve been a bit boo-hooey-poor-me this week but it’s finally Friday and THANK GOODNESS the pink eye of death has officially left our house. Hopefully. I haven’t bleached the door knobs yet so maybe I should knock on wood. Since I’ve been a Debbie Downer this week and everyone tolerated and commiserated while I threw my pity party/ies, I thought perhaps I should share some of my favorite things from the week past. Because there’s always a silver lining, right? We got word this week that Blair’s RAST test (the blood test to determine food allergies) came back negative to all dairy. This is awesome and confirms last week’s skin test. Next week brings the four-hour food challenge. Hopefully the girl will cooperate and actually drink the milk so, send good vibes our way. We’ll probably always keep her mostly dairy-free since it’s not great for her eczema. But I’m so, so excited for her to be able to enjoy the wonderful foods she’s had to miss out on. It’s going to be like her 21st birthday but with milk-based treats instead of alcohol. Ice cream! Pizza! Yogurt! Cheese! I’m trying to reign in it but oh, all the possibilities for deliciousness that have been unavailable for so long. Unknown to a lot of folks, Columbus has a great restaurant scene. One of these great little places is an ice cream shop called Jeni’s, where they have these amazing pairings of flavors like lemon and lavender and chili pepper and chocolate. In fact, Jeni’s was ahead of their time and had a salted caramel flavor years before it became vogue. So, I was ecstatic to find out they carry this heavenly stuff at Fresh Market and spent a pretty penny bringing home a pint of my own. I’m eating it one spoonful at a time. 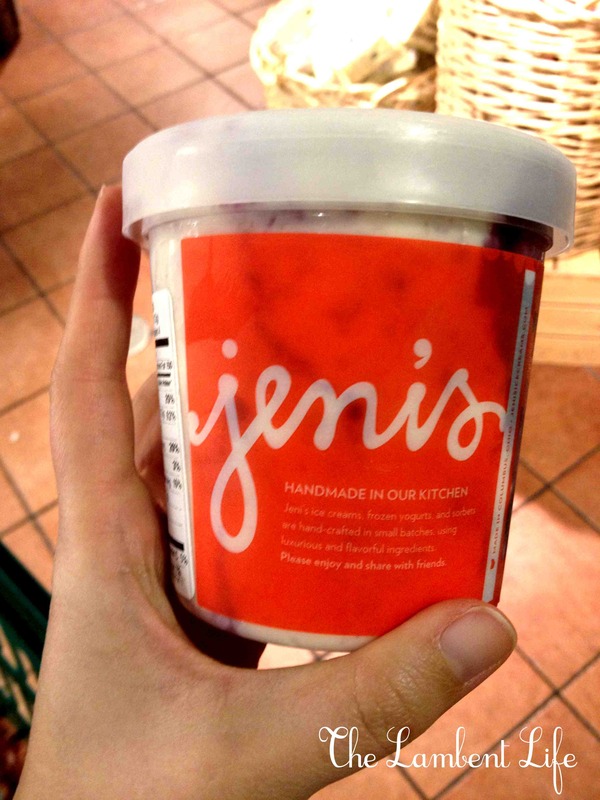 I found this at Fresh Market while spending a small fortune on Jeni’s and I’m addicted. I used to eat a lot of yogurt but had to stop when Blair was diagnosed with a milk allergy. When she stopped nursing, I never got back into the habit of eating much dairy. I guess my tastes changed. 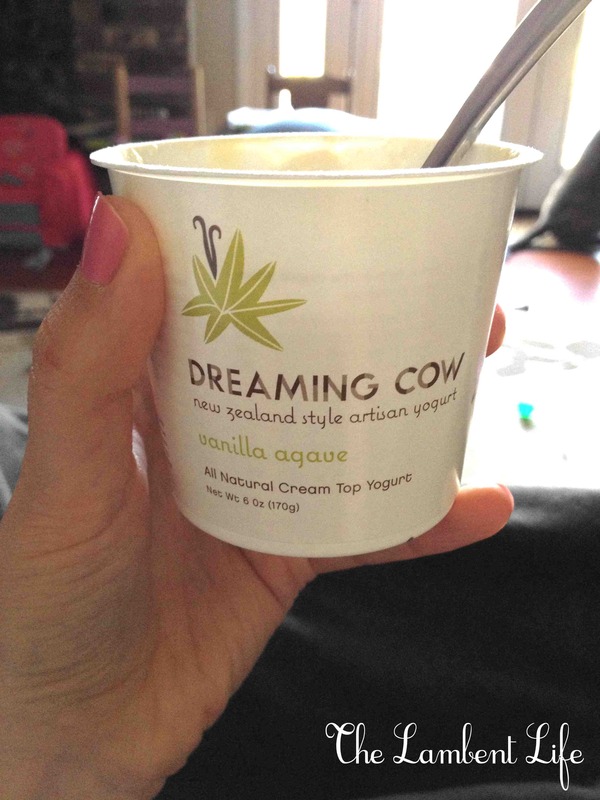 But I was intrigued by Dreaming Cow yogurt because it’s made locally in Georgia from a small farm with pastured cows. I tried two other flavors and the vanilla agave is by far my favorite. Since I grew up on a dairy farm, I’d love to see their farm and how they make these little cups of joy. I dropped the girls at mom’s morning out so I could get some long overdue chores accomplished and inevitably found myself at Target. Big surprise, I know. I worked my way around the store and ended up in the candle aisle. I spent the next 15 minutes picking up and sniffing every.single.candle. Some people are moved by melodies and memories are brought on by certain songs. Apparently my wires were crossed in utero because that’s what smells do for me. They make me feel things.The scent of jasmine and hibiscus reminds of one of the only family vacations we ever took to visit family in Arizona. As a teenager, my mother would simmer cinnamon and orange rinds in our kitchen. Mint will forever remind me of my father. 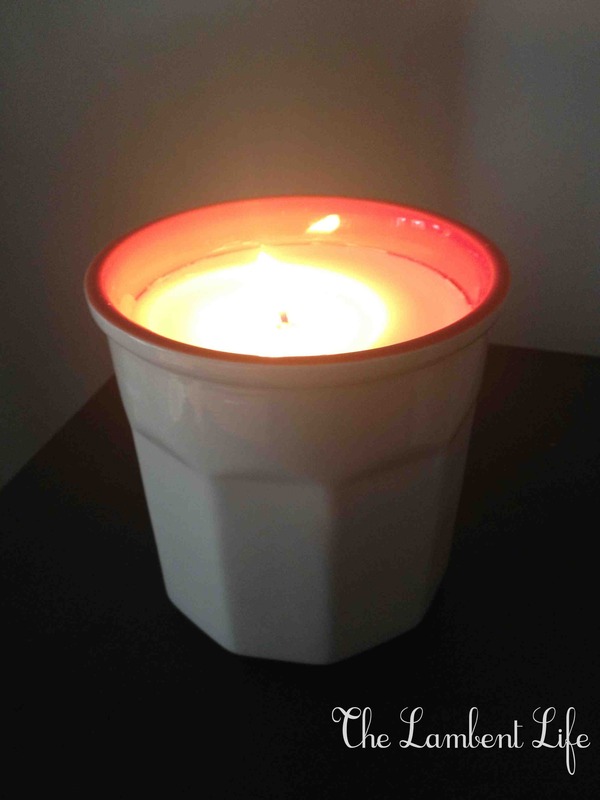 I finally decided on pink magnolia – not because it reminded me of a memory – but because it made me feel happy. And I liked the crock. I can’t remember which rabbit hole I traveled to find Our Freaking Budget but I’m digging it. It’s a young husband/wife blogging team sharing their journey about becoming (and staying) debt-free. The writing is witty and personal and the advice is solid. Josh and I are thiiiiiiiis close to being free from a boat load student loan debt (mostly mine, for a degree I’m not using, weee!) and I enjoy seeing how others strategize and prioritize to save a dime. Is anyone else chanting, “TGIF! TGIF!”? What’s on your “favorites” list this week? Big weekend plans? Emery loves words. She loves saying them, hearing them, dissecting them, rhyming them, teasing them and shouting them. But mostly, she loves repeating them. Again and again. She is never, ever silent. We can’t go anywhere without her engaging absolute strangers in deep conversation. Hi! What your name is? (we’re working on that) I’m Emery. (To which they say, ‘Emily?’) Em-er-y. Do you have any kids? What there name is? (again, at least she’s consistent) How old are you? I’m 3. This is my sister, Blair. (as the little one is trying to climb out of the shopping cart or run into traffic) She’s 2. It was really nice talking to you! You could say she’s a talker. Once upon a time, before children, I also loved to converse. Now I appreciate the silence that comes with the written word. Which is probably directly correlated to having a child who loves to talk. 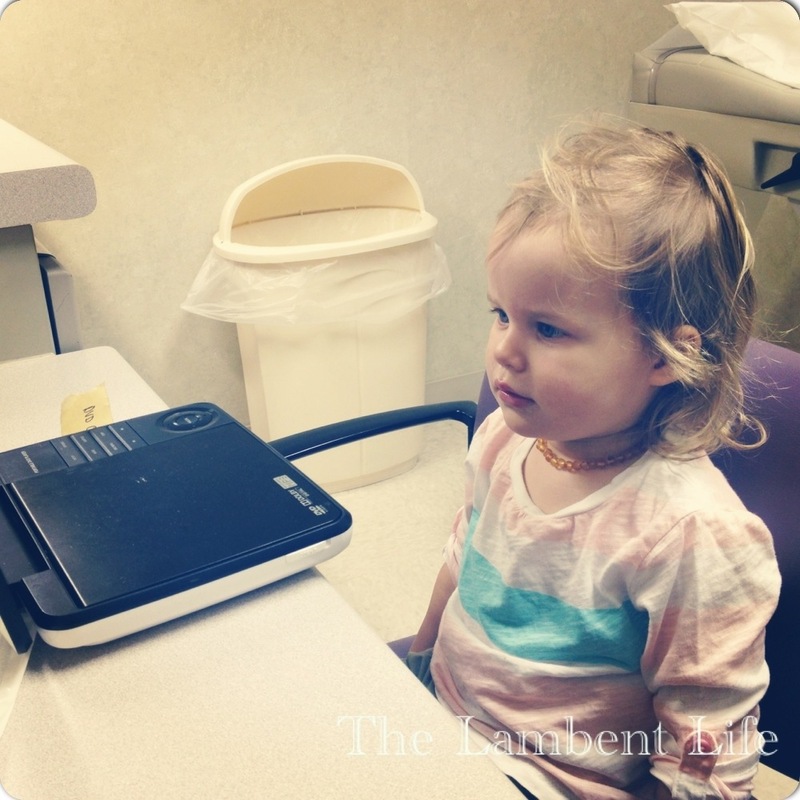 At nearly 4, it isn’t often that she hears an unfamiliar word. So when she does, she savors that sweet nugget under tongue and waits for the right chance to use it. And more often than not, her ignorance to these words was rather intentional. I’m pretty careful about what the girls watch and hear because you know it’s coming back out of her sweet little lips. And kids just know when a word is one not meant for repeating. This draw to forbidden words was kicked up a notch when she started preschool last fall. Suddenly “poopy,” “dirty underwear” and “stinky” became her favorite words. It bothers me. It’s crude. It’s unnecessary. But they’re kids. I don’t want to be that mom who expects her kids to be perfect and always proper. They should be polite but they’re learning the power of words – both positively and negatively. So we talk about words and their meanings and the right and wrong way to use them. So I ask her not to say “poop” unless it’s referring to actual defecation and she obliges. Until it sneaks out while she’s sing-songing in the backseat and I shoot her a glance in the rearview mirror. She giggles and squeaks a “Sorry, Ma!” and proceeds to tease me with every word (real and imagined) that rhymes with that four-letter word without actually saying that word again. She’s being silly and as much as it makes me cringe, I roll with it. Mostly. But I draw the line at name calling and hate. Those aren’t allowed in our home. Name calling is unproductive and unnecessarily hurtful. And hate is an ugly word with a meaning that kids shouldn’t be capable of understanding. So they shouldn’t use it. So It really surprises me how many times this comes up in television shows and movies targeting preschoolers. Dummy, stupid and other crude names are tossed around frequently. Em called me in this afternoon, confused because the fairies in her Tinkerbell movie said they hated another fairy. I’m sure we were exposed to this as kids, too, and it wasn’t an issue. So maybe I’m being oversensitive. But is it really necessary? This kid is a sponge. I suppose I just want to make sure what she’s absorbing is clean. How do you handle “bad” words? Are you strict with your kids words or should “kids be kids”? We’re on day three of pink eye. Ah, yes. Assuming it doesn’t spread from child-to-child or eye-to-eye. Any mother with a common sense than I would treat both eyes even if only one eye appeared infected. Apparently I’m lacking common sense and good judgement because those drops are expensive and getting them in the eye is a feat of strength and will. So I only treated Blair’s right eye. And today we have a left eye that’s nice and red. I’m just feeling selfish today. I’m so, so tired of being stuck at home. The girls are climbing the walls and getting into every sort of mischief imaginable. Blair’s new favorite play spot in the bathroom closet (hello, razor blades and mouth wash) and Emery is playing dress up with the dog. Thanks for taking one for the team, Lu. I haven’t had a run since last week. It’s not an excuse for my short temper but, goodness. I just want 30 minutes to run with my headphones blaring and no one crying. Except me. But it’s really hard to cry and run at the same time. I don’t know how they make it look so easy in the movies. 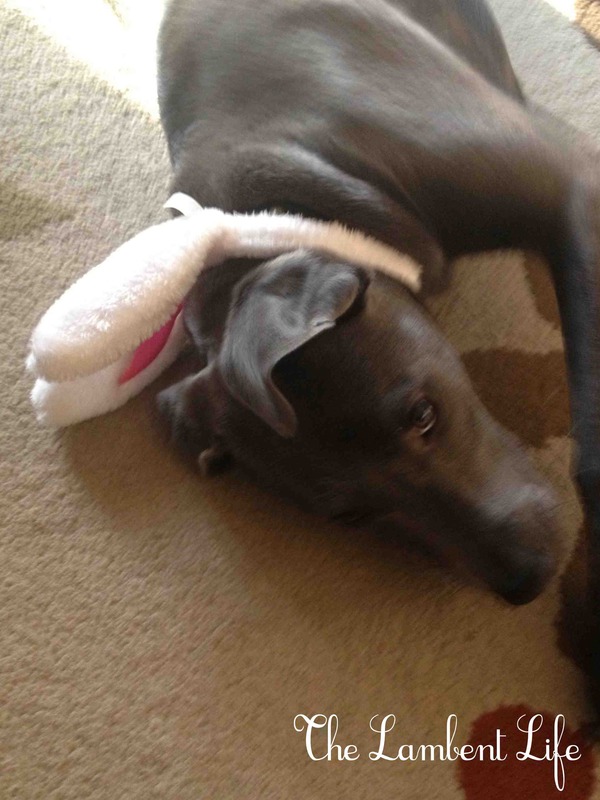 I don’t want to pick up another toy. I don’t want to wash another dish. I don’t want to fold another sheet. I don’t want to, I don’t want to, I don’t want to. I wish I could throw a tantrum like my daughters. But instead, I hold my breath and my tongue. And start by brushing my teeth..
One more day. It’ll be over soon. Assuming I don’t end up with pink eyes. Either way, I’ll do all those things that need to be done because someone needs to do it. There are 100 other things I could do to pass the time and make the day enjoyable. Instead I sit here having a pity party and scratching Emery’s back with my foot. And she’s enjoying it.